One Fat Frog Restaurant Equipment has several used salamanders available from a variety of brands including Vulcan and Wolf. They’re suited for char broiling and are going for seriously discounted prices at One Fat Frog Restaurant Equipment. Salamanders commonly come with stainless steel fronts, sides, backsplash, and bottom with heat shield. 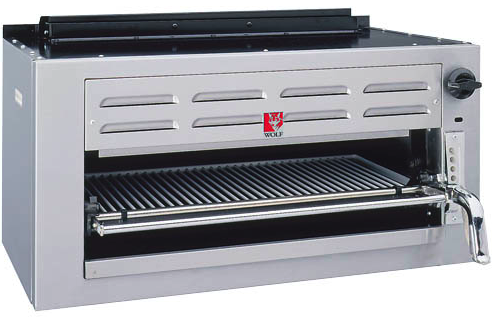 The fixed position broiling racks come in flat or easy tilt position, roll-in, and roll-out back. Salamanders come with a large capacity, easy to clean grease pan. The gas inlet on most counter top models is located on the rear. The burners on most salamanders have a pilot shut off. One Fat Frog Restaurant Equipment carries used salamanders from a variety of brands and you don’t have to break the bank to bring one to your restaurant. One Fat Frog Restaurant Equipment offers EZ financing, quick cash, and package deals! Come by One Fat Frog Restaurant Equipment today and check out the selection of used salamanders!